After consistent rain for the past few weeks, bikes took to the track in Pangkal Pinang, Indonesia today for the second round of the 2017 FIM World Motocross Championships, but it quickly transpired that conditions wouldn’t be good enough for them to run the full schedule and instead the FIM decided that the first free practice would be used to decide the starting grid for tomorrow’s racing. Of course, making a decision like this meant that riders who didn’t try to put in fast laps during this free practice suffered and will have bad gate picks on Sunday, but thankfully the World Suzuki MXGP and MX2 riders all got decent times and will have a good chance at some good results in what should be a battle of survival in these extremely muddy conditions. Work will obviously take place overnight on the track but with it raining daily, there isn’t too much they can do to improve the circuit, in what will be a real challenge for all the riders. All five of the Suzuki squad are still positive though and raring to go racing. “I was fifth, I rode easy and tried not make mistakes and came up fifth. We shall see what they decide about tomorrow and if they do both motos or just one moto. 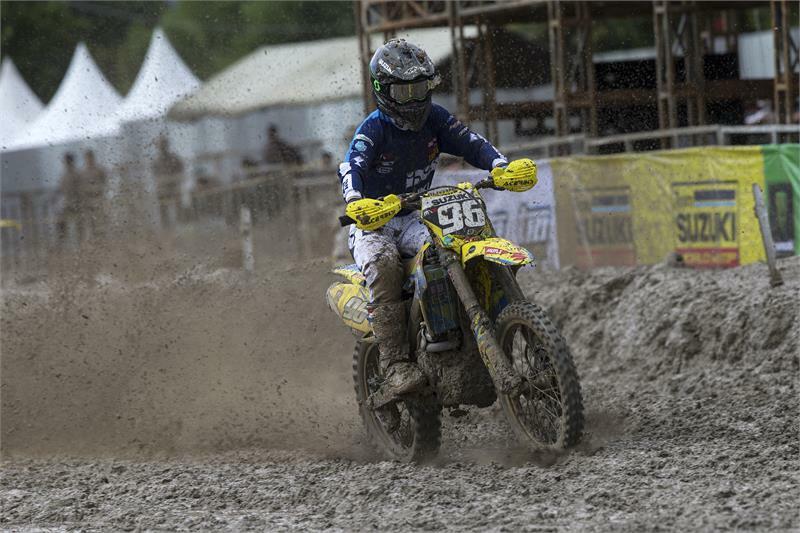 Hopefully the rain can stay away and if it does, they can fix the track and I think it can be pretty decent,” said Kevin Strijbos.